Nuremberg - Greuther Fürth kept their Bundesliga survival hopes alive after earning just their third win of the season in a 1-0 victory away to 1. FC Nuremberg. 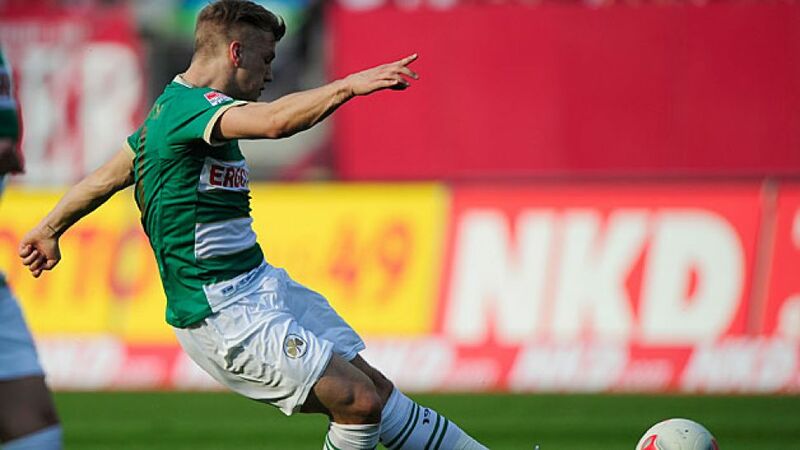 The only goal of the 256th Franconian derby was scored by 19-year-old Johannes Geis, who crowned an excellent all-round display with a sumptuous debut professional goal in the first half. The writing may have been on the wall for Greuther Fürth for some time now, but with the league's bottom club not yet mathematically condemned to Germany's second tier, they began intent on fighting until the end. The visitors went snarling into tackles in the opening period, unsettling their hosts and preventing them from establishing the short-passing game that has lifted them up the table in recent weeks. Accordingly, goalmouth action was scarce initially, with potshots from distance the best either side could muster. Just when it appeared the hosts had survived the early onslaught and were beginning to string some promising moves together, Fürth took the lead. Geis collected the ball 30 yards out and advanced towards the edge of the Nuremberg box unimpeded before unleashing a stunning left-foot strike into the top corner. Undeterred, the home side remained on top and began to look increasingly threatening, especially with Hiroshi Kiyotake floating menacingly across the midfield. It was from one of the Japanese international's swerving set-pieces that Nuremberg almost pulled level as Hanno Balitsch rose highest to meet a corner from the right, only for Wolfgang Hesl to tip his header on to the post, ensuring Fürth were ahead at the break for the first time during an away game this season. With a third victory of the season in their sights, the guests began the second half as they had the first, ferally launching themselves into challenges to protect their lead. The strategy was successful and Nuremberg were unable to build any momentum going forward with the game's flow interrupted by frequent free-kicks. While relatively secure in twelfth, the home side were not content to give up without a fight and continued to search for an equaliser. Again Balitsch came closest, but this time his header richoted off the crossbar onto the line and back onto the bar again before Hesl scrambled it clear. Try as they might in the closing stages, Nuremberg were unable to force a way through the packed Fürth backline, handing the visitors an unexpected victory and simultaneously ending Nuremberg's 11-game unbeaten streak at home.